Wyatt is very tall and the benefit for him is that he can get into a little bit more trouble than Ruslan. 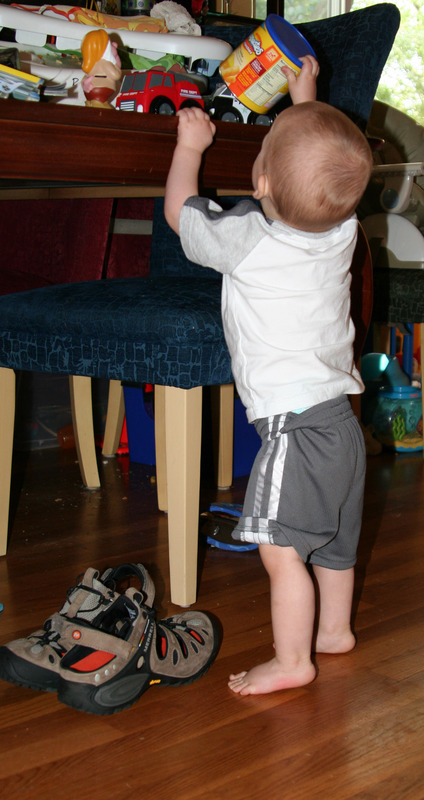 He is also scary smart – he is always 2 steps ahead, for example: he is across the room and sees that the TV remote is stashed on the back of the couch; he comes over and cries to be picked up as if he is terribly sad; then he laughs and grabs the remote from behind me. Making his way on to the couch is currently Wyatt’s greatest goal. 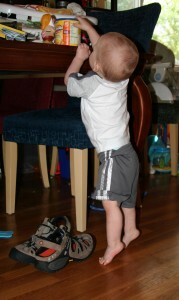 On this occasion he pushed the step stool across the room and used it to climb. 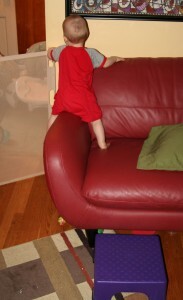 Then he went directly to the corner to investigate the gate – most likely trying to figure out how to conquer that enemy next. 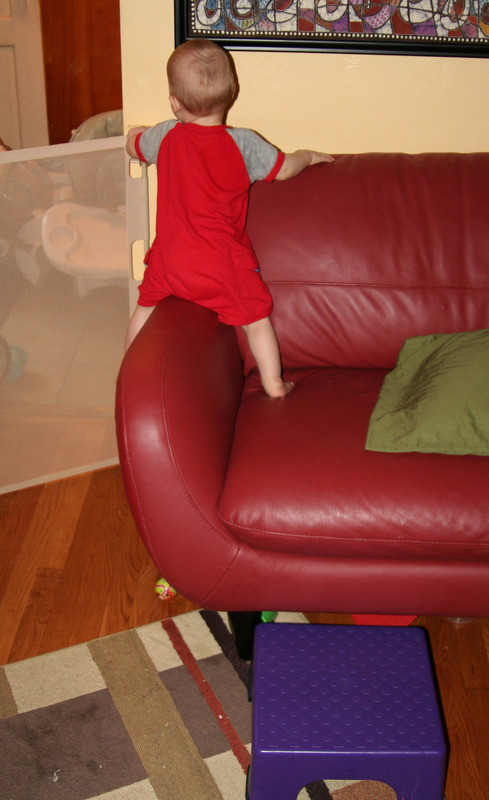 I quickly snapped this picture (the camera was within arms reach) and grabbed him as we was about to drop over the side of the couch to the floor. 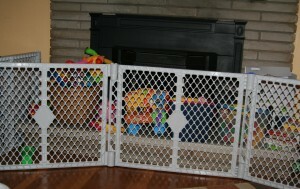 There are few places in the main living area where we can keep things out of reach. The remote and the phones are the most prized items. 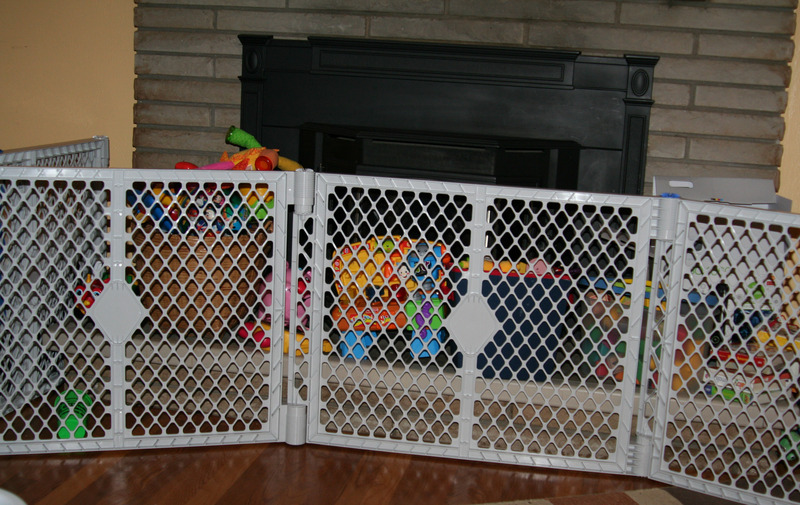 We finally broke down and bought a gate for the fireplace area – it was too dangerous for them to play there and now we have an area to keep toys so every toy bucket isn’t dumped and dragged across the room by 7:00 am each day. Both boys can grab anything along the edge of the dining room table, and Wyatt has figured out how to stand on his tippy toes so he can reach even more stuff. They had just finished dinner, but Wyatt already wanted a snack.